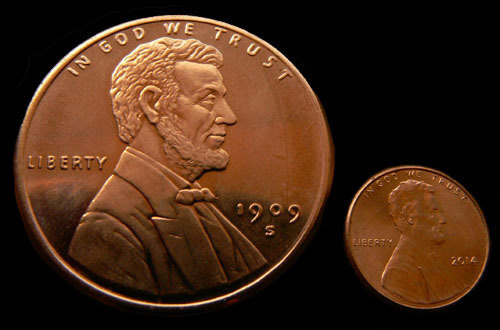 Size comparison with normal penny coin. 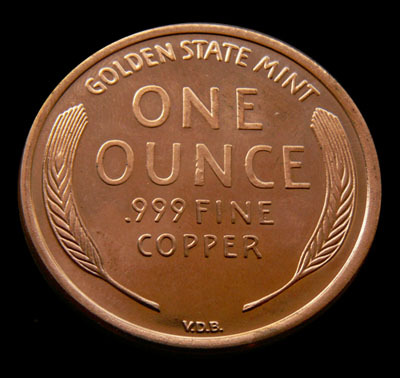 One ounce of high purity (99.999% pure) solid Copper metal (atomic number 29) forged into a 1909 Lincoln penny. Not only great for element collectors, but these are great for magic tricks (my grandson is convinced I can make pennies grow big). Measures a little over 1.5" in daimeter (40mm). Bright, shiny & new. Comes in a small plastic pouch. Makes a great inexpensive gift. One of the last affordable investment metals.